There you go. Is that not descriptive of what my life, and yours, as a Christian should be? Sure. We are the light of the world, we are to spread joy among people, we can triumph over adverse (as in “Adversary”) circumstances, and, in the end, WE WIN! Perhaps you’ve never thought about what facial expressions your behavior elicits from Jesus, but I did the other day while I was driving, and glanced down at the picture of Jesus I have on my dashboard. “For those of you in Rio Linda,” it’s a painting, not a photo. Anyway, it is a well known work by Richard Hook—a more contemporary looking Jesus than many traditional representations. He is not smiling, but to me he looks like he is about to.Check it out here. As I motored along pondering Jesus’ expression, I broke out laughing. Why? Because I think it looks like he is lovingly saying (to me), “Seriously? What were you thinking? Actually, I knew what you were thinking, but did you have to go and do it?” I just broke out laughing while writing this paragraph. 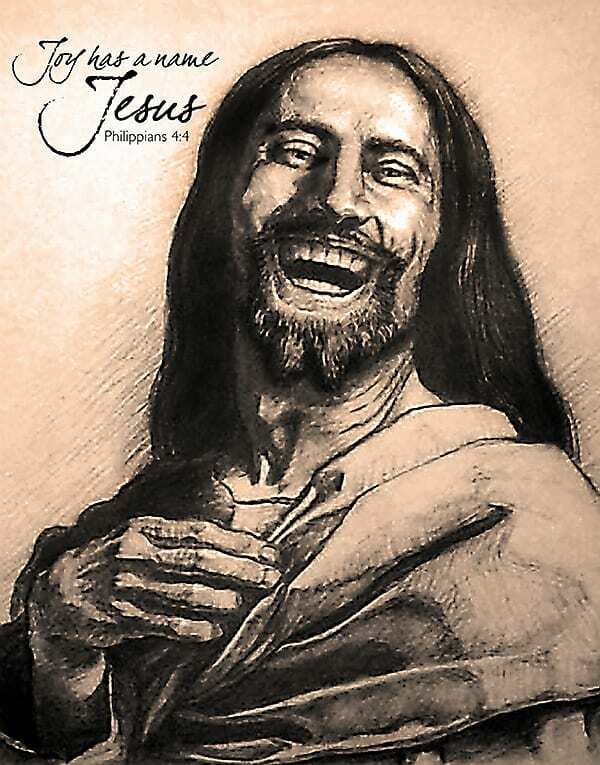 Actually, I’m glad that after too many years of having no personal relationship with The Man who gave his life so that I could live, I now enjoy talking/chatting/conversing/agonizing/weeping/laughing, i.e., fellowshipping (koinonia=fully sharing with one another) with the Lord Jesus (1 John 1:3). Don’t you? Think about it—Jesus Christ is the most human being ever, and he still feels all that he did when he walked amidst the suffering of the world, including great joy when he sees us, his brethren (and his best friends), brilliantly shine his light to others. Countless humans today go through the motions of “life” consumed by an eviscerating identity crisis. The secular world holds before them the carrot of “self-esteem,” but constantly reaching for that ersatz remedy only takes one deeper into the dark labyrinth of SELF, which is not the solution, but the problem “it-self.” As we know from the Epistles that Jesus gave to Paul for us Christians, one can find his true identity only IN CHRIST, a truth especially prominent in Ephesians. Too bad Moses couldn’t read that when he was experiencing his own identity crisis, as recounted in Exodus 3. At age 80, 40 years after fleeing from Egypt, he was out tending his sheep when Yahweh showed up, miraculously got his attention with a chatty shrub, and set before him a glorious mission, the accomplishing of which would determine the success of God’s plan of redemption. And what was God’s reply to Moses’ self-doubt, which was really God-doubt? In verse 12 He said, “I will certainly be with you.” What’s the point? Anyone plus GOD makes a majority, and anyone who trusts and obeys Him finds his true, God-centered identity in his relationship with the Creator. For us Christians, it is our SONSHIP that assures us who we really are. We know that IN CHRIST we are free from the penalty of sin, and righteous in the sight of God. Romans 7:14-25 (See One Day With The Creator, Segment 23) shows us that SELF, that is, the sin nature we each inherited from Adam, is our mortal enemy. Knowing who you are IN CHRIST, and acting accordingly, is the key to crucifying that sinful nature and walking in newness of life. That is the only genuine “self-esteem.” And it is the only genuine motivation to lay down our lives for others in service to the Master, in grateful response to his literally doing so for us. Focusing on serving others for the sake of Christ is the key to manifesting the love, joy, and peace of the Lord Jesus. 1 Peter 4:1-2 is exquisitely rendered as follows in The Message: “Since Jesus went through everything you’re going through and more, learn to think like him. Think of your sufferings as a weaning from that old sinful habit of always expecting to get your own way. Then you’ll be able to live out your days free to pursue what God wants instead of being tyrannized by what you want.” AMEN. Our other precious granddaughter is Mahalia Sol. While we were visiting last month, a few days before her 13th birthday, she referenced a popular movie in her youthful sub-culture. When I made some disparaging remark, she airily replied while leaving the room, “It’s iconic, and eminently quotable.” I repeated that aloud to be sure I actually heard her say it! Well, that precocious statement certainly describes Jesus, and it can also be true of you and me as we rivet the eyes of our heart on him and walk in his steps, energized by his love and power. Who are you?You are one BELOVED BY GOD. What can one person do—when he walks with GOD? See Bible. See History. Look in the mirror. See YOU.